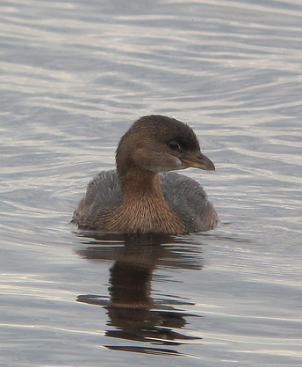 Newburyport Birders Guided Birding Tours | The Pied-billed Grebe is a Feather Eater! The Pied-billed Grebe is a Feather Eater! 24 Aug The Pied-billed Grebe is a Feather Eater! I’ve seen a Pied-billed Grebe at the salt pannes a few times on the Refuge recently. I introduced the bird to a new birder on Thursday evening. Grebes do fascinate me! and that bill was the periscope. Highly designed for water with legs set far back on the body like “divers”, making them efficient waterbirds. They’re gawky on the solid part of the earth’s surface and come to land to nest. They bathe and preen in the sun while I peered through my scope. I watched as they used their billsto obtain oil from the oil gland. Grebes are often described as tail-less, and Proctor & Lynch’s “Manual of Ornithology” refers to the tail of the grebe as vestigial.